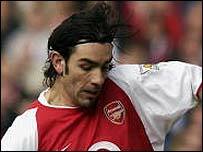 Arsenal's Robert Pires has been named Barclaycard player of the month for February. The Frenchman netted both goals as the Premiership champions began the month with a 2-1 victory over Fulham. He was also on target in the Gunners' 5-1 hammering of Manchester City and featured in their 1-1 draw with Newcastle. The French star suffered a serious injury at the back end of last season which caused him to miss the title run-in and the World Cup. But he has bounced back impressively this season and is once more returning to top form.